Looking for the memory sticks?? Here are list of the memory sticks you can pick one for you. 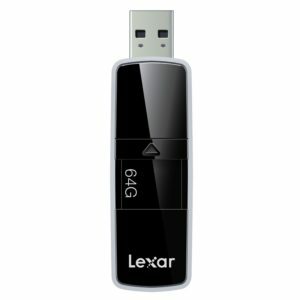 With USB 3.0 technology, the fastest USB flash drives can even compete with external HDDs (hard disc drives) for speed, with the advantage of being far more portable. Lets get into suggestion list. 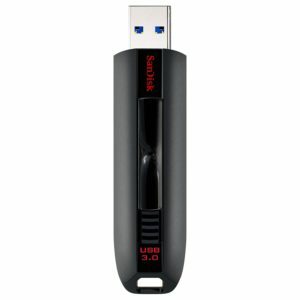 SanDisk is one of the most recognisable and respected names in the flash drive market and their Extreme CZ80 is among the most balanced portable storage devices available to consumers. 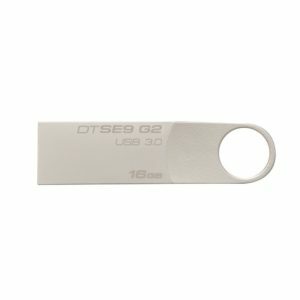 Combining speed, durability, value and encryption, this flash drive is the best choice for most people. With read speeds topping 245 Mb/s and write speeds of almost 200 MB/s, this drive outperforms most of its competition. Forget lengthy transfers over the cloud. This device can transfer a full-length SD movie in about 10 seconds, 50x faster than USB 2.0 drives and even lapping most competing USB 3.0 drives. It also comes with AES 128-bit encryption and RescuePRO data recovery software. While it is a bit long at 2.8 inches, it is made with durable plastic and comes with a lifetime warranty. You can get USB 3.0 speed in a compact and durable metal USB drive from Kingston for under $10. It sports a capless design with a sturdy keyring, perfect for travel or as a part of your everyday carry. The design can even be customized to add your logo or company name. Read speeds top 100 Mb/s, while write speeds are on the slow end. With a five-year warranty, a great design, and a value price, this small drive makes a perfect addition to your keyring. Apple smart products don’t come with USB ports, so you will need a backwards compatible drive that can also plug into lightning devices. 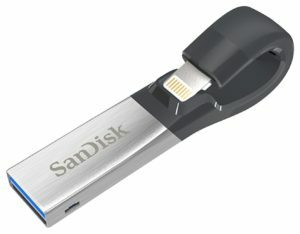 This thumbdrive from SanDisk is designed for ease of use with iPhones and iPads, thanks to a curbed plastic connector that fits behind the back of the screen. It has high-speed USB 3.0 transfer speeds and can hold over 7,200 photos or 8,000 songs. It has automatic photo backup and contact transfer to help free up space on your devices without having to deal with the slow upload speeds. 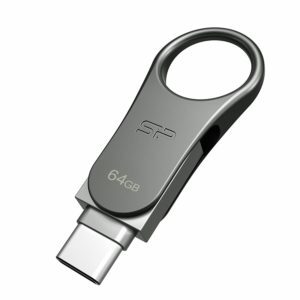 Macbooks require a USB Type-C device, which is where this swivel dual flash drive from Silicon Power comes in handy. It features a dual interface with USB Type-C and USB Type-A 3.0 ports on opposite ends of a compact device. The 360-degree swivel cap protects whichever connector is not in use and attaches easily to keychains. The C80 doesn’t require any special drivers or software to work; just plug it into the port and it is ready to go. But it has an optional file management app, which is a free and simple automatic file categorization that puts your work in the appropriate folders. Expect fast read and write speeds and 64 GB of storage to hold all your photos and files. Most of us are haunted by memories of glacial USB transfer speeds, when it seemed like a photo album would never make it onto your laptop. With the JumpDrive P20, those memories are long gone. In fact, you can transfer 1,000 photos in just over a minute or a full-length HD movie in less time than it takes to load and buffer a Netflix video. This zippy drive has read/write speeds of 400/270 MB/s, beating out external hard drives. In addition to being one of the fastest drives on the market, this drive is constructed with a sturdy metal alloy case with an attractive black glossy finish. It also comes with 256-bit AES encryption to keep your files safe. USBs get lost. They fall out of pockets and get left behind in computers. 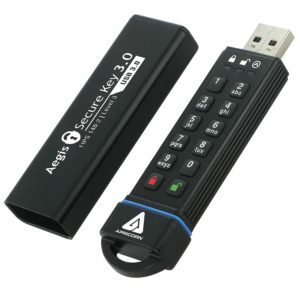 If you have data that can’t fall into the wrong hands, this two-step security key from Aegis will let you rest easy. The first layer of protection is a 7-15 digit code on an alphanumeric keyboard. These codes can be set and cleared by an admin account, making these drives reusable at offices or agencies. The second layer of security is a 256-bit AES Military Grade Hardware Encryption. This meets FIPS 140-2 Level 3 cryptography specification. Part of what sets this drive’s encryption apart is a lack of external software or firmware for encryption. With no software, there is no chance of an exploit that can compromise your files. Finally, the device is IP58 dust- and water-resistant to protect your files from physical damage. One word of warning: while this drive is USB 3.0 compatible, it doesn’t have fast transfer speeds since it is designed for security rather than performance. 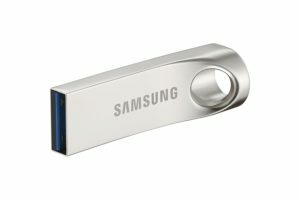 Anyone who has accidentally left their flash drive in their pants pockets through a laundry cycle will appreciate the durability of this Samsung drive. Its durable metal casing is waterproof, shockproof, magnetproof, and resistant to high temperatures. The drive is housed inside the metal casing, so it won’t break off (and the keyring is made with the same quality casing, again helping your drive live longer). 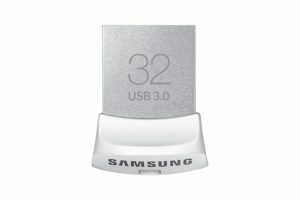 Samsung believes in this drive enough to provide a five-year warranty should anything happen. Durability isn’t its only perk, either. USB 3.0 and NAND technology gives this drive data transfer respectable read speeds of up to 130 MB/s and write speeds over 100 MB/s. It is also backwards compatible with USB 2.0, but expect a drop in transfer speeds. With their paper-slim profiles, Ultrabooks and tablets are barely thick enough for a USB port. That’s why some of the bulkier drives on this list are not ideal for those devices. Meanwhile, Samsung’s Fit drives are slim and compact, about the size of your thumb nail. This unobtrusive storage is constructed with a metal casing that is resistant to the elements and NAND flash technology. With USB 3.0 tech you can expect fast read speeds, while the price is easy to stomach. Just make sure to attach it to a lanyard, so you don’t lose it. 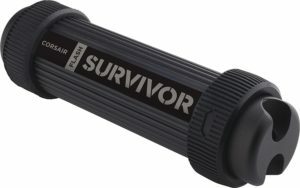 If you are taking your data to the extreme ends of the Earth and need to go a step above and beyond to keep it safe, the rugged Corsair Flash Survivor Stealth 64-bit is the drive for you. Constructed with aircraft-grade aluminum housing and outfitted with a molded shock damping collar, this drive is meant to survive anything you can throw at it. It can even be submerged in up to 200 meters of water because of the EPDM (ethylene propylene diene monomer rubber) waterproof seal. With speeds at around 85 MB/s, this isn’t the fastest drive around, but its ruggedness is unparalleled.